The biggest cooking day of the year is almost here! And now that I picked up our turkey this morning (gotta start the dry brine tonight!) 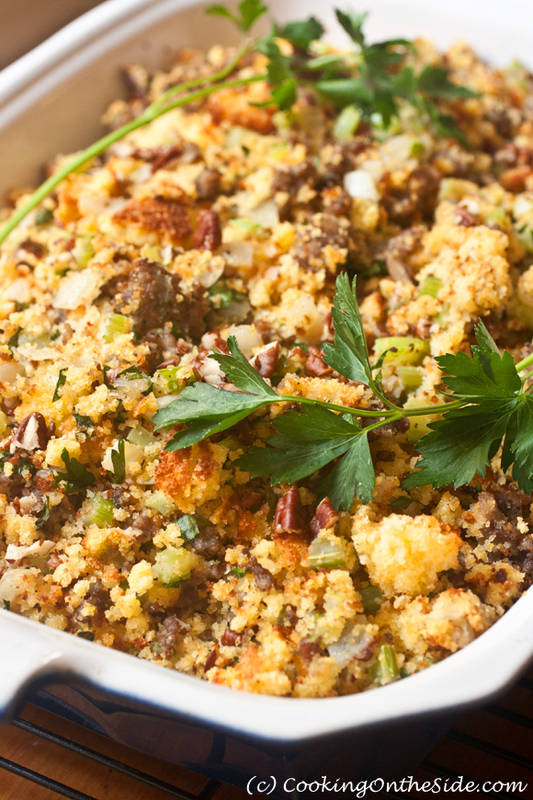 and I’ve made this Corn Bread, Sausage and Pecan Dressing to share with you, I feel as though the festivities are already well underway. Turkey: I’m dry brining à la Los Angeles Times for the 3rd year in a row. 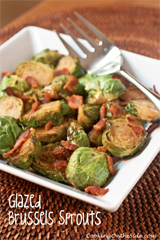 It gives incredibly flavorful turkey, with crispy skin. Not a lot more I can ask for. Mashed Potatoes: Again, I’m sticking with what has worked for the past several years – the Mashed Potatoes with Crispy Shallots from Food & Wine. I picked up a potato ricer last year and fell in love with the fluffy results. 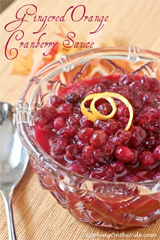 Cranberry Sauce: I loved the Gingered Orange Cranberry Sauce last year so much that it earned a spot on this year’s menu, barely edging out my tried-and-true favorite classic version. 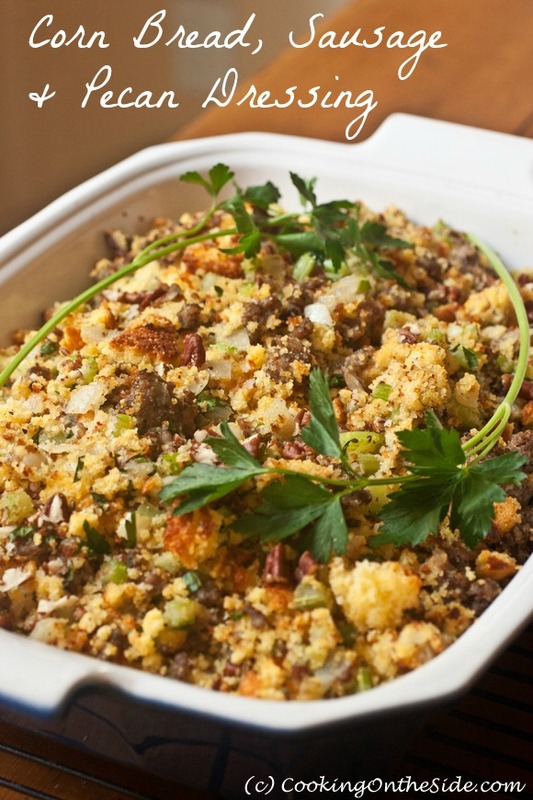 Green Bean Casserole: I’ll always love the classic version, but this year I’m anxious to try out a from-scratch version from my friend Jane’s blog, This Week for Dinner. 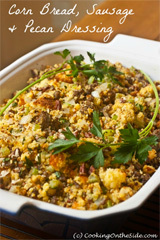 Stuffing: That will be the aforementioned Corn Bread, Sausage and Pecan Dressing I’m sharing today. Maybe it’s the golden color, but corn bread dressings have always looked so incredibly savory and satisfying to me. You could add dried cranberries or apples to this recipe to give it a sweet element, but I think it’s just perfect as is. Read on for the recipe below! Bread: I have always served rolls for Thanksgiving (last year I made these Classic Dinner Rolls), but this year I was a bit dazzled by the idea of popovers in Martha Stewart Living. She suggests a few different variations in the article – I’m going to go with the chive ones! Pie: Until this year, I’ve always said it wouldn’t be Thanksgiving without good old-fashioned pumpkin pie. However, my dear sweet almost-4 year old has requested Banana Cream Pie. He’s never tried it before, but it sounds amazing to him (as well as to his father and sister). So that’s what we’re going with this year, and I think the recipe from KCRW will do the trick. Now that I’ve written all that out, I’m really excited for Thursday! How about you – will you be sticking to your traditional dishes this year, or will you branch out to try something new? I’d love to hear! * For the 4 cups crumbled cornbread needed to prepare this recipe, bake 1 cornbread recipe (or 1 pkg. (8.5 ounces) corn muffin mix according to the package directions for the pan of cornbread). Cool, then coarsely crumble. To toast the crumbled cornbread, preheat oven to 400°F. Spread the cornbread onto bottom of large shallow baking pan. Bake 10 minutes or until lightly browned, stirring after 5 minutes. I love a good banana cream pie and would choose it any day over pumpkin. Your little one has excellent taste! Kathy I want to have dinner at your house. That lineup looks amazing. I love this dressing, I’m a huge fan of sausage of dressing. Gorgeous photo, makes me want to dive head first into the dish, lol. What a fabulous menu! We go fairly traditional – generally all the same dishes that everyone likes each year. This year, instead of mashed potatoes I’ll be making latkes since it’s the 2nd night of Hanukkah! I don’t think anyone will complain!